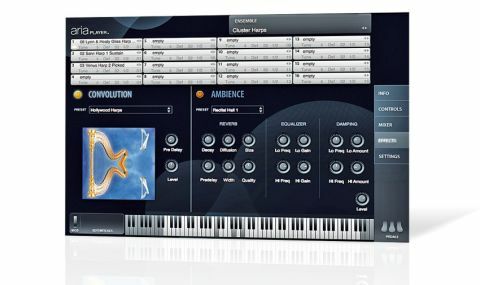 If a virtual harp is on your shopping list, put this one at the top - it's approachable, intuitive and sonically stunning. Sounds magnificent. Broad tonal spectrum. Easy to use. As the creator of the seminal GigaHarp GigaStudio library, Gary Garritan knows a thing or two about sampling harps. His latest, Garritan Harps, comprises 3.5GB of samples, recorded using four harps - two Salvi Pedals, two Venus Concert Grands and a Lyon & Healy - and played back using the included Aria Player (VST/AU/ RTAS/standalone). "Garritan Harps, comprises 3.5GB of samples, recorded using four harps - two Salvi Pedals, two Venus Concert Grands and a Lyon & Healy"
Five articulation patches are available for each harp (except the Lyon & Healey, which gets four): Sustain, Picked, Harmonics, Pres de la Table and Damped. These can be loaded singly or all together in a keyswitched patch. A set of six Dynamic and Performance controls come premapped to six MIDI CCs, including Release, Pick Noise (for the Picked and Pres de la Table articulations only), Aggressiveness (saturation and brightness) and Live Mode, which dials in random pitch and volume variations for a more 'human' feel. Other sound shaping options include Stereo Stage control, with a range of virtual mic positions, a 3-band EQ and two excellent reverbs - algorithmic and convolution, the latter including some suitably ethereal and majestic harp-orientated presets. Activating Pedal mode brings another level of harping authenticity into play, with the seven MIDI- controllable pedal sliders pitchshifting the seven white notes up and down to sharp, double sharp, flat or double flat, just like on a real pedal harp (actually, outperforming a real harp, which can't do doubles). In Pedal mode, the black keys become silent. An extensive array of preset Gliss patches give access to pedalled glissandi in a range of keys and scales. The manual gives plenty of history and playing advice, which makes getting to grips with these potentially intimidating instruments easy. Our favourite is the Lyon & Healy, but they all sound magnificent and between them cover a broad tonal spectrum.